To commemorate the grand Asian international philatelic event, the “Macao 2018 – 35th Asian International Stamp Exhibition”, is organized for the very first time in the Macao SAR. In addition to the commemorative stamps, Macao Post and Telecommunications Bureau will launch a thematic pack on 23rd September. 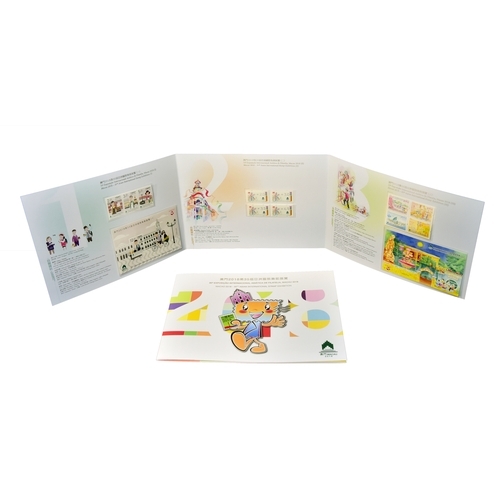 This pack gathers with three sets of commemorative stamps for this event, it is not only convenient for philatelists to collect the whole series of stamps, but also a valuable souvenir for the collection. The selling price of this pack is MOP120.00. It will be available for sale on 23rd September at the CTT counter of “MACAO 2018” in The Venetian Macao Cotai Expo Hall A, the Philatelic Shop of General Post Office, and from the following day (24 September) at “Rua do Campo” Post Office, Maritime Ferry Terminal Post Office, Airport Post Office, and the Communications Museum.